Portland's container terminal operator is working with an Idaho senator to stop unions from slowing down work as a negotiation tactic, following months of nearly stand-still conditions at West Coast container ports. Sen. James Risch, an Idaho Republican, introduced a bill in Congress that would define slowdowns as an unfair labor practice -- a response to the backlog of ships and containers along the west Coast during months-long contract negotiation between the International Longshore and Warehouse Union and port operators. So far, no Oregon legislators have publicly supported the bill. "The practice of 'slowing down' the critical West Coast ports is dangerous for the Idaho economy and the larger national economy," Risch said in a statement. "With more than 65 percent of all U.S. container exports and the substantial imports traveling through ports like Lewiston, it is critical that these ports and their workers remain fully-functioning." The Oregonian/OregonLive reported in April that the Port of Lewiston has shut down its container terminal, because it relied on the Port of Portland's Terminal 6 to be functioning. But, Terminal 6, Portland's container terminal, has almost no business after its two major shipping lines stopped calling in the late winter. For years, tension between port operator ICTSI Oregon and the longshoremen has disrupted service in Portland. 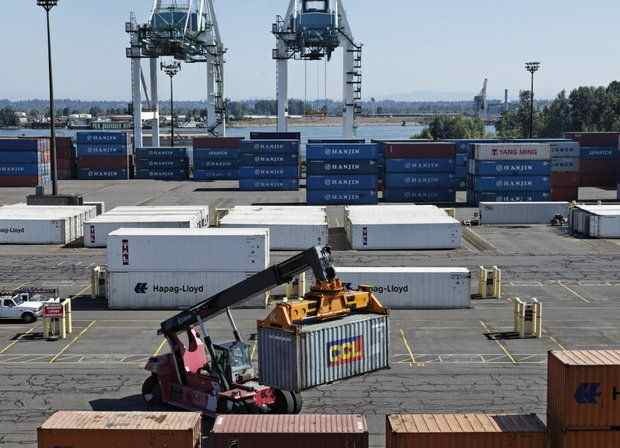 The slowed work during the contract negotiations was just the breaking point for shipping lines tired of years of low productivity and unstable conditions at Portland's container terminal. Named the Preventing Labor Union Slowdowns Act of 2015, the bill would amend the National Labor Relations Act on the rationale that union members use slowdowns as a way to keep receiving pay and benefits, but causing the same damage as a strike. During the latest contract negotiation period, port operators at 29 West Coast container ports accused the ILWU members who load, unload and move the cargo from ships of intentionally slowing the pace of work. The union members said they weren't dragging their feet as a tactic to force the port operators to appease them. The ILWU did not immediately respond to a request for comment. After an agreement was reached, many politicians, shippers and others in the trade sector called for a change to the negotiation process that wouldn't be so detrimental to the people who use the ports. "This legislation represents an important change to maritime labor law that will go a long way toward ensuring a more stable work environment at West Coast ports, one in which innocent parties are not subjected to severe economic damage by unfair union slowdown tactics," said ICTSI Oregon CEO Elvis Ganda. The bill has been referred to the Senate Committee on Health, Education, Labor and Pensions. It has no co-sponsors from even some of the more outspoken West Coast politicians. Oregon Rep. Kurt Schrader, a Democrat, said in a statement he is "deeply concerned" about the Port of Portland container terminal. He was among those calling for a more amicable contract process, but has not officially backed the bill. "He is closely studying this legislation and other legislative solutions to the situation," said Liz Margolis, spokeswoman for Schrader.